Everything about fifteen-year-old Cat’s new town in rural Michigan is lonely and off-kilter until she meets her neighbor, the manic, beautiful, pill-popping Marlena. Cat is quickly drawn into Marlena’s orbit and as she catalogues a litany of firsts—first drink, first cigarette, first kiss, first pill—Marlena’s habits harden and calcify. Within a year, Marlena is dead, drowned in six inches of icy water in the woods nearby. Now, decades later, Cat must try again to move on, even as the memory of Marlena calls her back. Told in a haunting dialogue between past and present, Marlena is the captivating story of an intoxicating, indelible friendship that does not flinch from the resonant effects of its loss. 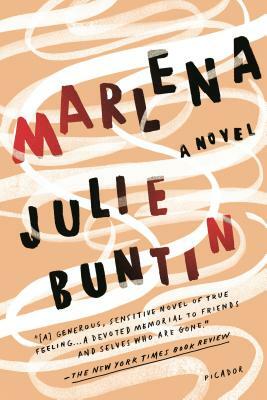 "Julie Buntin’s standout debut novel, Marlena. . . cannily interweaves two different time frames to capture an electric friendship and its legacy. . . .Buntin is attuned to the way in which adolescent friends embolden and betray. . . .Cat is a keen observer of all the markers of upward mobility: in this case, a New York life complete with a literary job and a kind, stable husband who makes dinner. The novel’s most impressive passages concern the watermark that remains, visible in the light of too many after-work martinis, and in attempts at adult friendships. "-Vogue, "Girls on the Verge"
“Julie Buntin’s debut novel, Marlena.. . .joins a glut of recent novels that pair a retrospective female narrator with an extravagantly charismatic but troubled friend. . . .But Marlena,unlike the others, seems to be aware of the complicity of these kinds of stories in perpetuating the mystique of girls who go wrong. . . .Buntin vividly captur[es] the slow, blurry creep of intoxication. The value of novels like Marlena .. . is how insightfully they capture the complex intensity of girlhood that can’t see yet how exquisitely vulnerable it is.” -The Atlantic, "My Brilliant (Doomed) Friend"
"A quiet, powerful look at addiction." -The New York Times, "3 Books Take a Deeper Look at the Opioid Epidemic"
"[A] mesmerizing debut . . .Buntin weaves an indelible portrait of friendship. "-Harper's Bazaar "14 Best new Books to Read in April"
"Riveting, heartrending"-BuzzFeed, "31 Incredible New Books You Need to Read This Spring"
"It’s rare that a literary novel gives me the feeling that Marlena did. . . .compelling, compulsory. . .[An] ice-clean story of two girls, one doomed, one in thrall, and what will happen to drag them both down into traps of their own making. "-LitHub, "15 Books to Read This April"